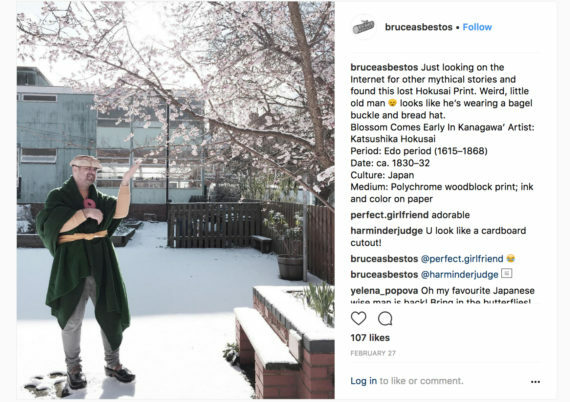 Bruce Asbestos is no stranger to social media, blurring the lines between documentation, comment and artwork. For the second in our ongoing series, Richard Taylor takes a look at the artist's use of Instagram as Asbestos gets his shoes together for a new clothing project inspired by Hansel and Gretel. 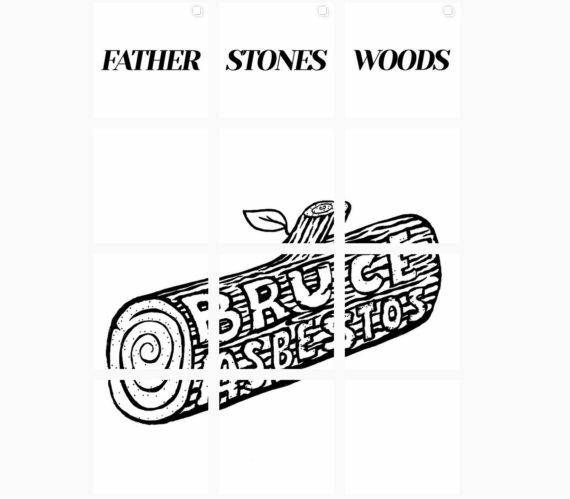 What drew me to Bruce Asbestos’s Instagram profile was his clever rendering of a large graphic, made by compiling several posts together and spelling out the words ‘Father – Stones – Woods’ with a chosen log graphic bearing his name. 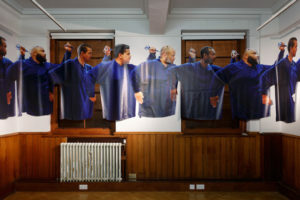 The Nottingham-based artist is launching his Autumn and Winter clothing collection on 19 May 2018, at Nottingham Contemporary. The project’s backbone is the story of Hansel and Gretel, and the clothing consists of, amongst actual clothes, sweets and shoes made from loaves of bread. It’s filling him with “giddy excitement”, you can tell. First trials of such footwear broke apart when worn and this imperfection was wonderfully documented on his colourful, selfie-infused, feed. I’m very pleased to announce the first Bruce Asbestos Collection – I’ll be working on this collection over the coming months. 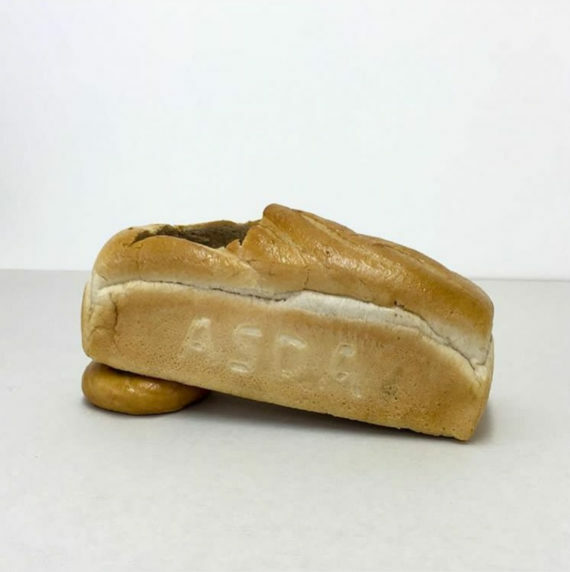 I’ll also be collaborating with Alison Lloyd on a series of photographs around the pieces @alisonclloyd http://www.alisonlloyd.co.uk/ This first image by Alison is a test version of the ‘bread shoe’ in the studio, a key item in the new collection. #fashion #runway #collection #2018 #style #shoes follow https://www.instagram.com/bruceasbestos/ for the latest updates. To produce the collection, Asbestos has been running workshops with Costume Design and Making students at Nottingham Trent University. He is taking the notion of workshops further in his current practice, thinking through possibilities and problems of labour and learning. Instagram is a great place to pull people together, acknowledging the work of others, captioning and capturing their production as well as your own. Evidenced by his master-crafted Social Media Takeaway ‘TV channel’ on YouTube, Asbestos navigates multiple social media platforms, enjoying how they “provide space to potentially share something with people you don’t know”. For Asbestos, social media blurs lines between performing, being and working as an artist. 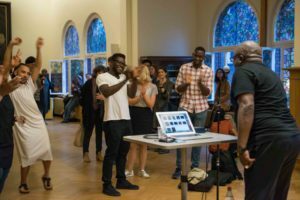 He finds this confusion attractive, allowing us to question “whether these little images [on Instagram] are artworks themselves, about artworks, or documentation of artworks”. He also has an interesting position on Instagram takeovers, or “takedowns”. Our previous Artists + Instagram feature looked at the work of perfect.girlfried (James St Findlay); Asbestos worked with Findlay for a takedown collaboration in Autumn 2017. There is an aspect of collaboration in his approach too. The artist is working with Alison Lloyd to shoot behind the scenes documentation of the making, and cat walking, of his collection artwork. Asbestos explains how the project is allowing him to get to grips with European pop art by asking “what it would look like, if you discounted the 1960s?”. He points the same question at his Instagram followers, referencing Japanese pop and its history of Manga connected to Hokusai’s 36 Views of Mount Fuji woodblock prints. He also dwells upon American pop and its “defined sense of self”.